On Nov. 1, 2018, Marilyn Ann Harral Umiker, age 75, died at the home of her daughter, surrounded by her children, at Star, Idaho. She was born July 12, 1943 in Buhl, Idaho, the daughter of Herschel and Gladys Harral. She had one sister, Joyce Ellis. Marilyn graduated from Buhl High School in 1961. Soon thereafter, she married and quickly became a devoted mother to twin daughters and a son. In 1975, the family moved from Buhl, Idaho to Glenns Ferry, Idaho. Her heart and home were always open to anyone who needed a place to live, a hot meal, a batch of cookies or a haircut. She lived a life that was full and fun. Marilyn was happiest when serving others. In September 1993, she married Eldon Umiker and moved to South Dakota, where they built a life together. She traveled back to Idaho at every opportunity to spend time with her kids and enjoy her beloved cabin in Pine. Her soul was at peace there. Marilyn was the proud mother of Wanda (Doug) Crandall, Wendy (Mike) Myatt and Jim (Lea Ann) Schrader, and proud grandmother of Jimmi, Jesika, and Justice Schrader. 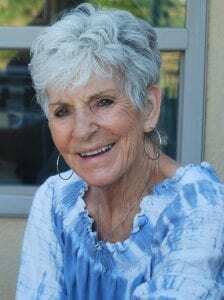 She was a loving step-grandmother to Kristel Cedergreen, Kyla Danziger, Talyssa Crandall and Kellyn Calloway, as well as great-grandmother to Riley, Eric, Nathan, and Tommy. She happily participated in the lives of stepchildren for 25 years: Barbara Umiker, Brenda Even, Bryan Umiker, Lisa Schaefer, Jonathan Umiker and Tina Pengra, as well as nine grandchildren, Moriah, Molly, Grace, Owen, Brady, Isabella, Emma, Kaitlyn and Jocelyn. Marilyn loved people. She was blessed with many friends. Her warmth, kindness and sense of humor will be missed. Funeral services will be held on Saturday, Nov. 17 at 11 a.m. at Bethesda Lutheran Church in Hot Springs, South Dakota. In lieu of flowers, donations can be made to your favorite charity, or to Bethesda Lutheran School, Hot Springs, South Dakota. Marilyn was a great lady. She will be missed!